A unique selection of houses and apartments in the Catalonian capital! 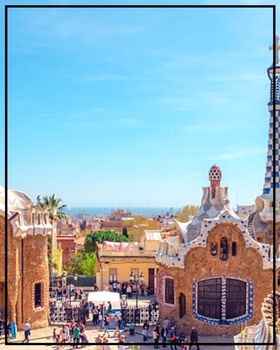 Barcelona, the capital city of Catalonia and the most cosmopolitan, modern and avant-garde town in Spain, welcomes you with open arms for a holiday that blends history with sun and nature! Discover the rich architecture and culture of Barcelona, with its mediterranean lifestyle, from the Gothic Quarter, to Gracia, to Eixample and El Born. You will be won over by this beautiful city of Catalonia, as you walk along the Ramblas, admiring Gaudi’s artwork (the Parc Guell, the Sagrada Familia, the Pedrera…), visiting the museums (Picasso, Miro, MNAC), having a drink and some tapas on the Barceloneta, shopping on the Passeig de gracia, watching Barça play (FC Barcelona) or even admiring the town from the heights of Tibidabo… And of course, the beaches are never far away! In the heart of the city or its surrounding areas, our apartments and villa rentals in Barcelona are luxurious, tastefully decorated and offering a plethora of customised services!